A long-awaited launch update from the two-person team at Milkbag Games. Hi, we’re Owen Goss and Matt Rix, the two-person team that has been making FutureGrind since… *checks watch*… 2014. Back in 2015, we told you that FutureGrind would be coming to PS4. 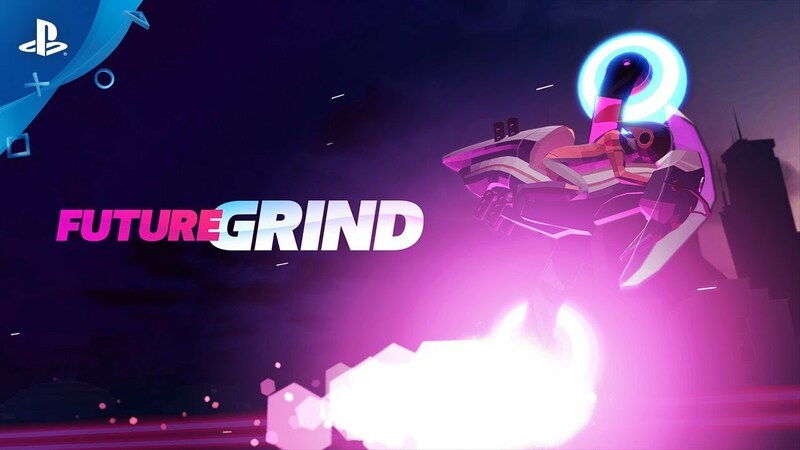 Now we are excited to announce that FutureGrind will be available from PlayStation Store on January 22! In 2015, we showed you some early footage of the game running. We had the core gameplay nailed down, but we knew we still had a lot to do to make the game look and feel the way we wanted it to. We’ve been working extremely hard these past few years to bring you the best game possible. FutureGrind features dozens of tracks spread across different environments. From the sunny beaches of Miramar to the snow-covered peaks of Ralhorn, and everywhere in between, you’ll have plenty to do. Earn different bikes as you progress through the game, each with their own unique style of play. One thing remains constant throughout the game: FutureGrind is a challenging stunt-sport that’s all about tricks, skill, and speed. PS4 leaderboards and trophies will keep you competing with your friends to see who can find the highest scoring runs on each track. When you start playing, survival will be enough of a challenge. But master the basics and you’ll find yourself racing tracks built for the pros. If you think you have what it takes to make it to the top, you’ll need to work at it. FutureGrind has a high skill ceiling and a deep combo system for you to explore, so you can play the game the way you want to. As you play through FutureGrind you’ll encounter different sponsor reps who will guide you in your quest for glory. But be careful. Not everything is as it seems. Someone’s watching your every move. But who? And what do they really want with you? FutureGrind features nearly 60 minutes of original music by bignic. Starting today you can pre-order the original soundtrack on Bandcamp and listen to a selection of songs from the album for the first time right now. One last important thing: when we first showed the game on PS Blog, you asked about support for color-blind players, as the game features a color-matching mechanic at its core. FutureGrind has a color-blind mode that lets you override the game’s default colors and pick the colors that work for you. We realized a one-size-fits-all approach wouldn’t work. We’re putting the color controls in your hands so that as many people as possible can enjoy the game. We have been working hard on this game for over four years, and we couldn’t be more excited to be bringing FutureGrind to PS4. On January 22, grab your bike and hit the rails with us. We’ll see you on the leaderboards. I had lost hope of this coming out ever since I demoed it at PlayStation Experience back in 2015. Now I’m bursting with hype and relief that this is still happening, and so close too! You can count me in for a day one purchase for both the game and the OST. Awesome! I’m glad you had a chance to play the game at PlayStation Experience way back in 2015. :) We know it took a long time to get here, but it’s great to hear you’re still excited for the game. We hope you enjoy it! Gotta admit, this looks like a TON of fun! :D Can’t wait! Great job you two!! Praxis sounds REALLY familiar, who’s doing his and Ada’s voices? This looks pretty cool, looking forward to snagging a copy. Thanks! The actors who did the trailer voice over work are Elizabeth Saydah (Ada) and Jason McCoy (Praxis). You’re welcome! :) It was really important to us that as many people as possible could play and enjoy the game. Wow! This looks challenging but in a good way! So excited for this game. I’ve played various builds of it at the past PlayStation Experiences and chatted with Owen about it. I’ll be getting it day 1! Obviously, the clips speak for themselves up there, but if you love games like OlliOlli or Trials, this is going to be perfect for you. Awesome! So nice to hear that you’re still excited for the game. Does it have platinum? Some games don’t and I’m just wondering if this does. My last pay check was $8500 working 1o hours a week online. My younger brother friend has been averaging 12k for months now and he works about 22 hours a week. I cant believe how easy it was once I tried it out. Hi. The game looks amazing and I was wondering if offline play is going to be in the game and if it is different. Thanks.